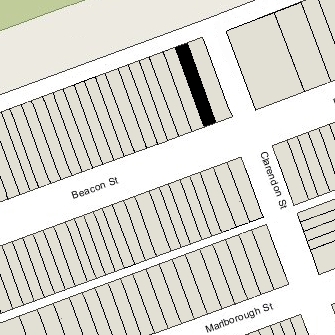 184 Beacon is located on the north side of Beacon, between Clarendon and Dartmouth, with 182 Beacon to the east and 186 Beacon to the west. 184 Beacon was built ca. 1866, one of two contiguous houses (182-184 Beacon) designed as a symmetrical pair and built for John Lowell Gardner on land which he purchased on July 16, 1860, from the Boston and Roxbury Mill Corporation. John L. Gardner and his wife, Catharine Elizabeth (Peabody) Gardner, made 182 Beacon their home. In his Houses of Boston’s Back Bay, Bainbridge Bunting indicates that 182-184 Beacon were built ca. 1866. John L. Gardner is first shown as residing at 182 Beacon in the 1868 City Directory, so it is possible that it was built slightly later. He probably had 184 Beacon built at the same time, but it appears not to have been occupied for several years. Click here for an index to the deeds for 184 Beacon. On March 25, 1870, 184 Beacon was purchased from John L. Gardner by shipping merchant Joseph Coolidge. He and his wife, Ellen (Eleanor) Wayles (Randolph) Coolidge, made it their home. They had lived at 12 Pemberton Square in the mid-1860s. Ellen Coolidge was the daughter of Thomas Mann Randolph and Martha Jefferson (daughter of President Thomas Jefferson). Joseph and Ellen Coolidge’s son, Joseph Randolph Coolidge, was the husband of John and Catherine Gardner’s daughter, Julia. Ellen Coolidge died in April of 1876. Joseph Coolidge continued to live at 184 Beacon until his death in December of 1879. 184 Beacon was not listed in the 1881 and 1882 Blue Books. On October 19, 1881, 184 Beacon was purchased from Joseph Coolidge’s estate by investment banker Henry Chapman Wainwright, who bought it at public auction, probably on behalf of Joseph Coolidge’s son, Thomas Jefferson Coolidge, to whom he transferred the property on December 5, 1881. 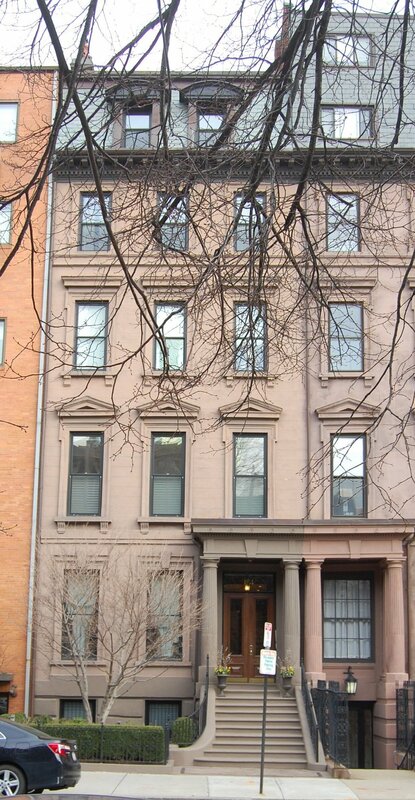 T. Jefferson Coolidge and his wife, Mehitable (Hetty) Sullivan (Appleton) Coolidge, lived at 93 Beacon. He was an investor in textile mills, banks, and railroads, and later would serve as Ambassador to France. In 1901, soon after his wife’s death, he purchased 315 Dartmouth and made it his home. By the 1882-1883 winter season, 184 Beacon was the home of T. Jefferson and Hetty Coolidge’s son-in-law and daughter, attorney Lucius Manlius Sargent and Marian Appleton (Coolidge) Sargent. They previously had lived at 231 Beacon. In May of 1883, Lucius Sargent applied for (and subsequently received) permission to build a stable at the rear of the property. Lucius Sargent died in November of 1893, and Marian Sargent moved thereafter to the Tudor at the corner of Beacon and Joy Streets. By the 1903-1904 winter season she was living with her widowed father at 315 Dartmouth (Hetty Coolidge had died in March of 1901). On November 1, 1894, 184 Beacon was acquired from T. Jefferson Coolidge by his daughter-in-law, Clara Gardner (Amory) Coolidge, the wife of Thomas Jefferson Coolidge, Jr. They previously had lived at 170 Beacon. They also maintained a home in Magnolia. Thomas Jefferson Coolidge, Jr., was a banker and co-founder (with his father) of the Old Colony Trust Company. Thomas Jefferson Coolidge, Jr., died in April of 1912. Clara Coolidge continued to live at 184 Beacon. In July of 1917, she applied for (and subsequently received) permission to remodel an existing garage (presumably the former stables, being used as a garage), bringing it into conformance with fire and building code requirements. Clara Coolidge continued to live at 184 Beacon until about 1932. On June 27, 1933, 184 Beacon was acquired from Clara Coolidge by Helen M. McGovern, and on March 30, 1934, it was acquired from her by Herbert G. Sumner. The house was not listed in the 1933 and 1934 Blue Books and was shown as vacant in the 1933 and 1934 City Directories. On March 31, 1934, 184 Beacon was acquired from Herbert Sumner by Margaret (Thomas) Gardiner, wife of William Tudor Gardiner. They also maintained a home in Augusta, Maine, and later in Woolwich, Maine. William Gardiner was an attorney and had served as Governor of Maine from 1928 through 1932. The Gardiners continued to live at 184 Beacon until about 1949. On June 30, 1950, 184 Beacon was acquired from Margaret Gardner by Emerson College. In May of 1950, prior to taking title, it had filed for permission to remodel the house and convert it from a single-family dwelling into a radio and television instruction studio. The application was approved, but appears to have been abandoned. On December 30, 1953, 184 Beacon was acquired from Emerson College by the Society of the Divine Word. It became the Boston office of the Divine Word Missionaries, Inc., of Techny, Illinois. In April of 1980, Divine Word Missionaries filed to confirm the existing occupancy as a “missionary house for priests,” noting that this had been the use for many years. On May 11, 2006, 184 Beacon was acquired from the Divine Word Missionaries by 184 Beacon Street LLC (Jean N. Abouhamad, manager of record). In June of 2006, it filed for (and subsequently received) permission to convert the property into four apartments, including constructing a penthouse depressed into the roof line. On January 7, 2008, it converted the property into four condominium units, the 184 Beacon Street Condominium.